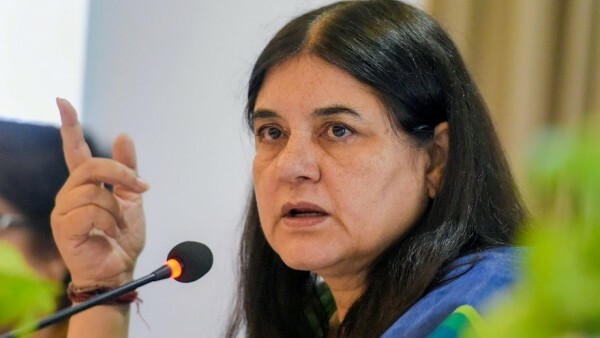 Not children of Gandhi: Maneka. Exactly 10 years ago, Varun Gandhi had to go to jail for a hate speech against Muslims in which he threatened to cut off the hands of those who harm Hindus. That was in her mother’s Philibhit constituency which he is representing this time. And now her mother and Union Minister Maneka Gandhi is on camera telling a gathering of Muslims in Uttar Pradesh's Sultanpur, from where she is contesting the national election, to vote for her or else she may not be inclined to be responsive to their requests or help them. Its all about give and take, she is heard saying in a video clip that has gone viral. "I have already won this election, now it is for you to decide," the BJP leader says. Maneka Gandhi, later in the day, clarified that her words had been twisted. "I love Muslims and I had myself called a meeting of the BJP's minority cell. I only meant to say that I am winning the elections and their participation would be like 'daal pe chaunka'." “My feelings get hurt. If Muslims then come to me asking for work, then I will think let it be, how does it matter? Dil khatta ho jayega. After all, a job is a deal,” she said, making it clear that Muslims should not expect jobs if they do not vote for her.